Ceiling fans are very popular in American households. They are decorative and they provide enhanced comfort, especially during hot weather. The Gossamer Wind was conceived by Danny Parker at the Florida Solar Energy Center as a means of realizing the energy efficiency and comfort potential of ceiling fans. The Gossamer Wind series ceiling fans can provide significant energy savings. Compared to conventional ceiling fans, they consume approximately half the energy in operation, saving an estimated $20 per year in electricity costs while providing the same or greater air velocities. To date, approximately 2 million Gossamer Wind ceiling fans have been purchased across the country, saving users more than $40 million annually. These savings can be further augmented by the reduced air conditioning from raising thermostat temperatures. This is possible since the enhanced air flow allows people to be equally comfortable at temperatures that are 2-4 °F higher. The Gossamer Windward Series is currently available at Home Depot stores across the nation and online in several models. All have an Energy Star rating. To view the available models, search for “Windward” on Home Depot’s website. 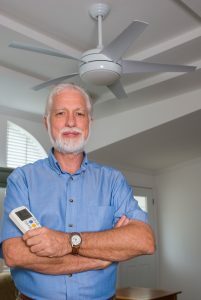 Are Energy Savings Due to Ceiling Fans Just Hot Air? Monitoring hydrogen storage and usage sites for leakage is a crucial step in a safe operations plan. To assist NASA in readily discerning the presence of hydrogen leaks, researchers at FSEC have been developing methods for detecting the presence of hydrogen. Since it is such a light gas, diffusing readily, its leakage from a storage tank, in transport or during use can pose potential safety problems. Because hydrogen is also invisible and odorless, developing a system that provides greater ease of use than the currently-employed sensors has been a great challenge. The “smart paints” reveal, in an easy-to-see manner, the presence of hydrogen due to minute gas leaks. Drs. Nahid Mohajeri, Gary Bokerman, Nazim Muradov and Ali T-Raissi have been working on these materials under a grant provided by the NASA-Glenn Research Center. Hydrogen is a propellant used by NASA for launching the Space Shuttle and other space vehicles at Kennedy Space Center. Unlike natural gas leaks that can be easily detected by their odor, hydrogen leaks are difficult to detect. Operations at NASA facilities require the use of extremely pure hydrogen with no additives to the gas permitted. The UCF technique provides a visual method to detect and locate possible hydrogen leaks that may occur in the field lines, flanges and joints for hydrogen transport and use. To ensure that hydrogen leaks can be readily detected visually, UCF researchers, in collaboration with the NASA-KSC colleagues, have been modifying existing formulations and developing new ones to provide easy application and unambiguous results. 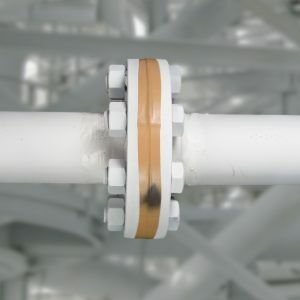 The “smart paint” can be applied in various forms at pipe connections, valve joints, or other points that may be susceptible to leaks. When there is a hydrogen leak, the paint changes color, alerting technicians to correct the problem. The “smart pigments and paints” have been formulated to change color irreversibly for one time-use, with the color variation remaining even when the hydrogen is no longer present. This system has been field tested at NASA-KSC, and sample kits have been sent to other NASA Centers for evaluation and feedback. 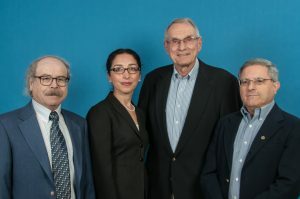 FSEC’s Advanced Energy Division researchers, left to right, Nazim Muradov, Nahid Mohajeri, Gary Bokerman, Ali Raissi. Not pictured: R. Paul Brooker. Alternative applications use chemochromic tapes impregnated with the “smart pigment.” UCF researchers have also developed special tungsten-based pigments that revert to the original color after hydrogen leak has ceased. 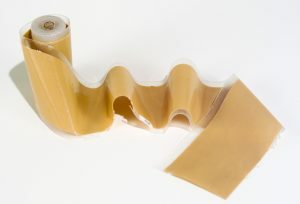 These special reversible pigments, intended for “repeated use” applications, have been prepared and are currently undergoing field testing at NASA-KSC. Researchers plan to continue development, field testing and weathering assessment of the repeated use and one time-use articles suitable for service in temperatures as low as –359° F. Additionally, efforts will continue toward lowering the overall production costs of the chemochromic materials. 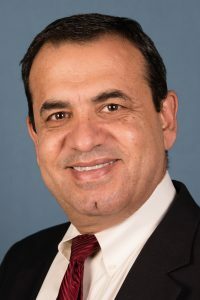 Dr. Issa Batarseh, director of the Solar Systems Research Division, developed low cost, high efficiency micro-inverters for photovoltaics with his team at the University of Central Florida. He has since utilized this technology to co-found two start-up companies; Petra Systems and ApECOR (Advanced Power Electronics Corporation). Petra Systems have introduced “Smart Streetlights”, which are composed of small PV panels, micro-inverters, and wifi technology placed on streetlights. Available as a streetlight replacement or a retrofit, these systems allow utilities to offer blanket wifi access to travelers, solar power generation, and real-time control of individual streetlights. 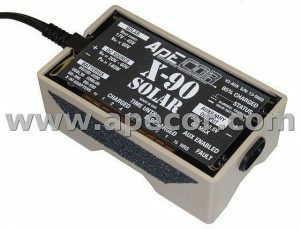 ApECOR (Advanced Power Electronics Corporation) is a research and development business which focuses on power electronics. Some of their products include the micro-inverter technology Dr. Batarsed helped to develop. Dr. Batarseh has also been inducted into the Florida Inventors Hall of Fame, you can read more about this accomplishment in the UCF Today article.